Would new roads ease gridlock? 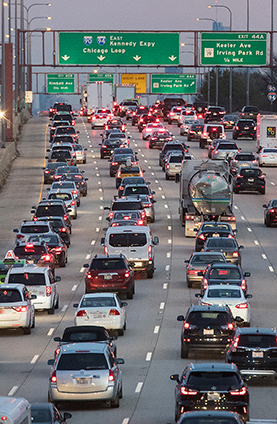 Traffic congestion is a perennial but growing problem in the United States, frustrating motorists, wasting time and fuel and costing drivers, cities, employers and others nearly $300 billion a year in direct and indirect costs. The average rush-hour commuter spends about 42 hours per year — the equivalent of a week's work — sitting in traffic. Traditional solutions, such as expanding roads or building public transit systems, have had only a limited impact. Almost as soon as traffic flows more freely, experts say, more drivers take to the roads, boosting traffic until it backs up again. Some transportation analysts believe raising gasoline taxes or imposing more tolls might deter drivers, but such proposals spark political resistance. Eventually, technological advances such as self-driving cars may make traffic more manageable. Meanwhile, the Trump administration and Congress are gearing up for a major debate over a $1 trillion plan to rebuild the nation's aging roads, highways, bridges and other infrastructure, which some say would help ease congestion.